How to make grilled salmon topped with grilled nectarines and goat cheese. 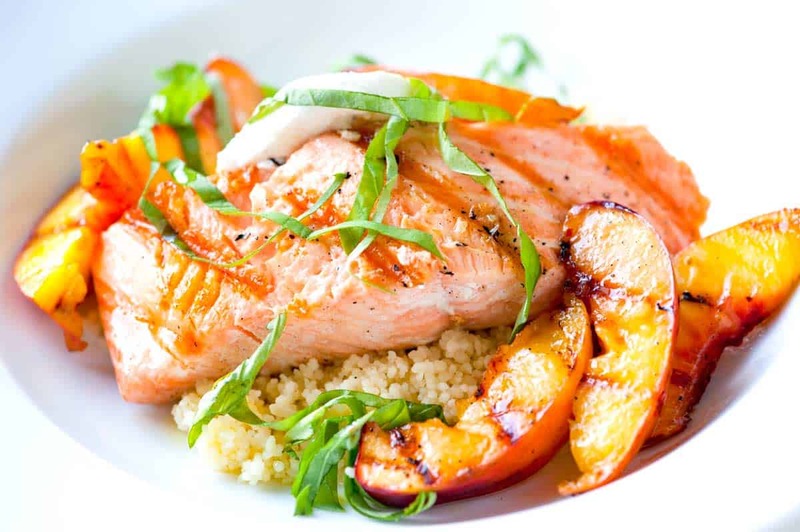 Jump to the Grilled Salmon Recipe with Nectarines and Goat Cheese or read on to see our tips for making it. The salmon is simply grilled — only with salt, pepper and olive oil. That’s okay, though, because we toss nectarines in maple syrup mixed with a pinch of red pepper flakes and grill them. Everything comes together on a bed of couscous with fresh basil and a dollop of goat cheese on top. YOU MAY ALSO LIKE: Grilling salmon on a cedar plank is genius. 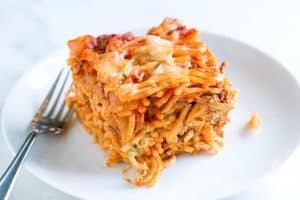 If you haven’t tried it, let me tell you, you need to. 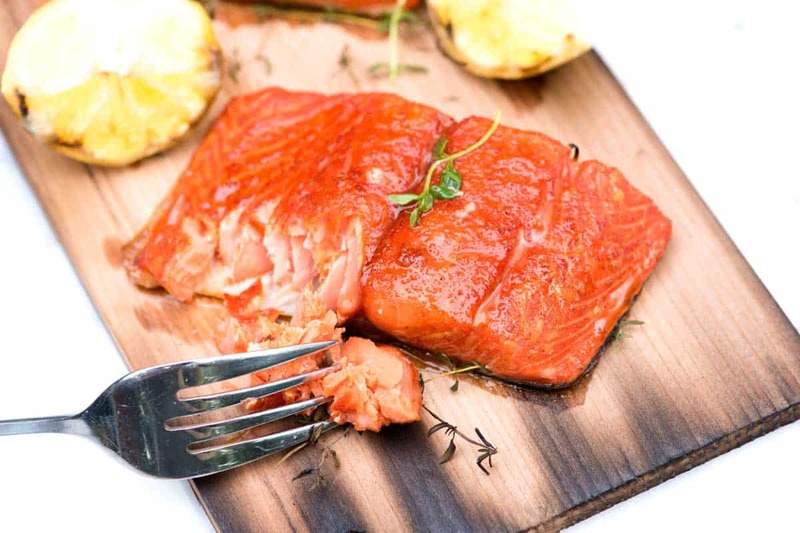 Jump to the Sweet Citrus Cedar Plank Salmon Recipe. You can grill salmon one of two ways — outside or indoors using a cast iron grill pan. If you are outside, prepare the grill for cooking over medium-hot charcoal or moderate heat for gas grills. For an indoor cast iron grill pan it should be lightly oiled, well-seasoned and over medium-high heat. To prepare the salmon, rub with a little olive oil then season with salt and pepper. Grill the salmon, 5 to 6 minutes on each side (depending on thickness). While the salmon grills, thrown on some nectarines or peaches. To grill them, remove the pit then cut into wedges. 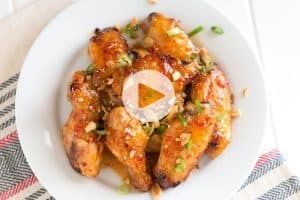 Toss with a little olive oil then add some maple syrup and a pinch of red pepper flakes — this makes them a little sweet with a spicy kick. 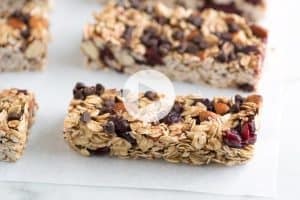 Throw them onto the grill and cook until you begin to see grill marks and they are warmed through — about 2 minutes on each side. YOU MAY ALSO LIKE: How to make perfectly marinated and grilled swordfish kabobs with lemon, pepper and thyme. 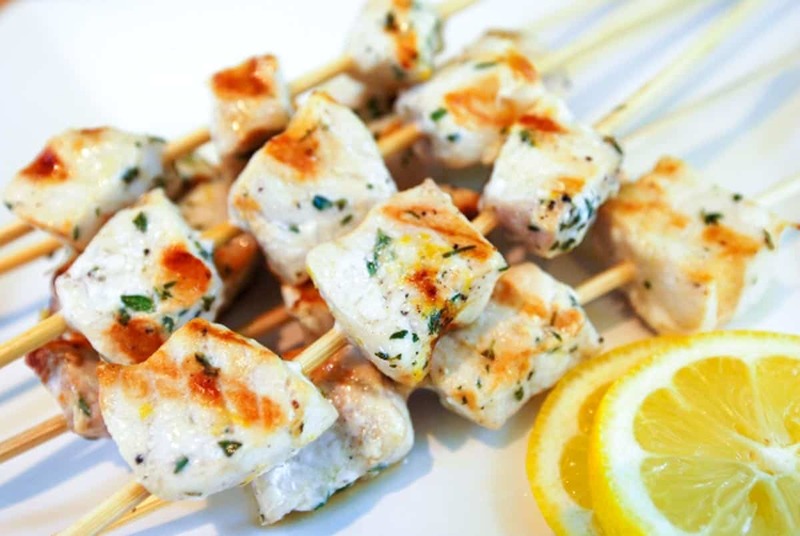 Jump to the Lemon Pepper Grilled Swordfish Kabobs Recipe. The nectarines can be replaced with peaches or other stone fruit (apricots would be lovely). Prepare a grill for cooking over medium heat. (If using outdoor grill, it needs to have very clean grates). If grilling inside, heat a lightly oiled, well-seasoned grill pan over medium-high heat. Wipe salmon fillets dry with paper towels. Brush on both sides with olive oil. Season with salt and black pepper. Grill the salmon, turning once and cooking for five to six minutes on each side, or until it can easily be flaked with a fork. (If you have one, take the salmon off the heat when an internal thermometer reads 135 degrees F). Meanwhile, toss nectarine wedges with a teaspoon of olive oil, the maple syrup and crushed red pepper flakes. Place onto the grill and cook until warmed through and grill marks appear, about 2 minutes on each side. 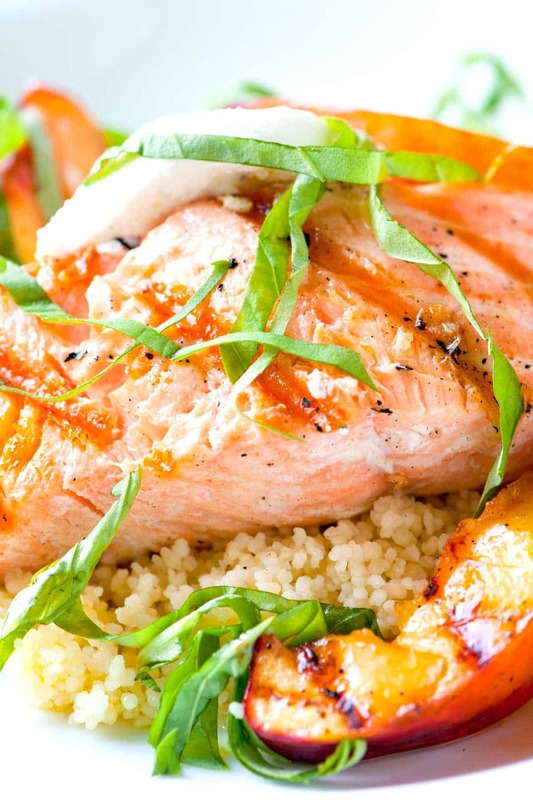 Serve salmon on a bed of rice or couscous topped with grilled nectarines, a few crumbles of goat cheese and fresh basil. I absolutely love your website. 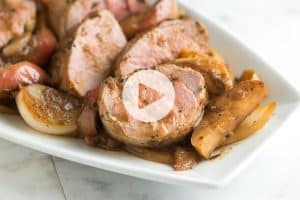 Do you think that peaches would work well for this recipe? 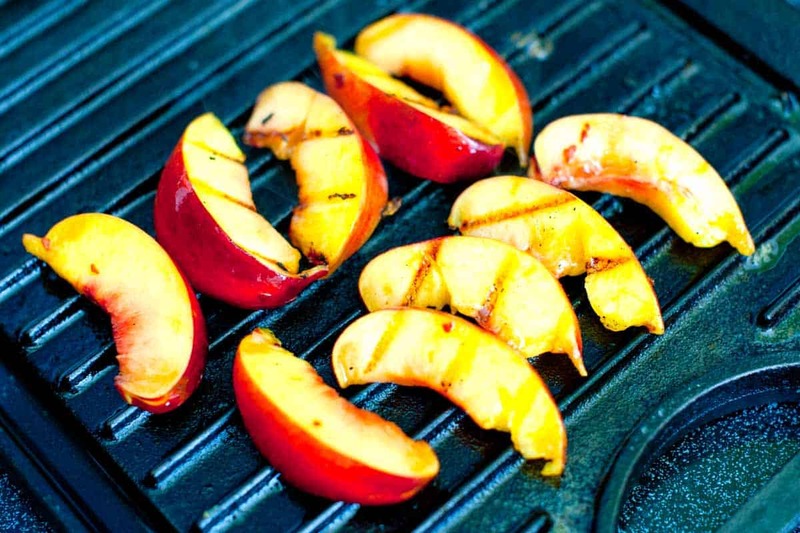 I absolutely LOVE grilled fruit of any kind & especially with meat or fish!